Lotus Connections -- it's just too easy to integrate! I'm writing this blog entry as a guest author to the Synch.rono.us blog. That blog is kept by Suzanne Minassian, who recently did an awesome job demonstrating that our product is better than Microsoft's, and two software developers: Joseph Russo and David Brooks. I personally think it's great that we can hear directly from the product development team and keep up to date with what's happening in their world. While I generally prefer not to market Lotus Connections to IT, it's always helpful to help them understand how flexible and extensible our Lotus Connections platform is. I have already blogged about some of the cool things that you can do with Lotus Connections, but I wanted to summarize them here in an easy to find blog entry. Before we get started, you should know that Lotus Connections follows the SOA principles and it's mostly built on RESTful services and open standards. As such, you can re-use and leverage these services from pretty much anywhere! So where do you do your day-to-day work? In Sametime? Mobile with your BlackBerry? In Microsoft Office? In Microsoft Outlook? From any of those, you can download and install a free plug-in and access your social data instantly! And with Lotus Notes v8.5, you will be able to take Lotus Connections Activities offline! All of these are just examples of what can be done with the Lotus Connections Atom APIs! The landing page of Lotus Connections can be easily extended by IT. 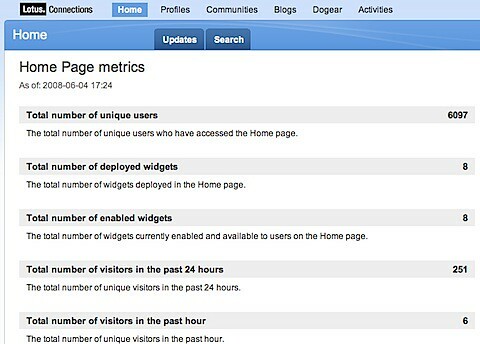 An administrator has total control of which widgets can be deployed to the page. An end-user has total control of which widgets they want to see and the layout of these widgets. Currently, I'm working with a colleague on publishing an article to developerWorks which will describe how to create your own widgets. Therefore, stay tuned to the Lotus Connections page on developerWorks. While you can build widgets on your own, Lotus is also coming out with a widget building tool. With the Lotus Widget Factory, IT will be able to create their own widgets very easily! Our best-of-breed Profile component is easily customizable without writing a single line of code! The Profiles page, like the Homepage, is also a Mashup of widgets. As such, an IT administrator can easily change the layout of the screen or even add their own widgets created with the Lotus Widget Factory. Check out some of the other things you can do today! Oh and Profiles also has the concept of Profile Types! This means that you can define different types for your organization, for example: Legal, IT, Executive, Non-Exempt, and so forth. With each profile type, an IT administrator can control which personal fields are displayed for users that have that profile type. The request that I hear the most from my customers is the need to hide email address for some employees. 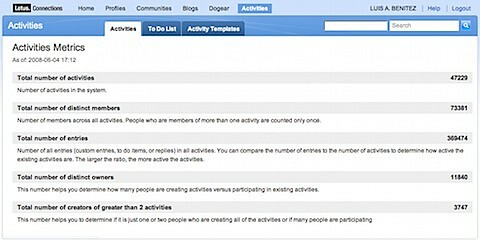 With profile types, this can be configured in minutes!! Of course, we can't leave out the person card. Say what? Your users live more in rich-client applications than in web applications? No problem!! You can also get the person card in rich client applications!!! As an example, we've added the person card to Microsoft Word, Microsoft Excel, Microsoft PowerPoint, Microsoft Outlook, Lotus Notes, and Lotus Sametime! 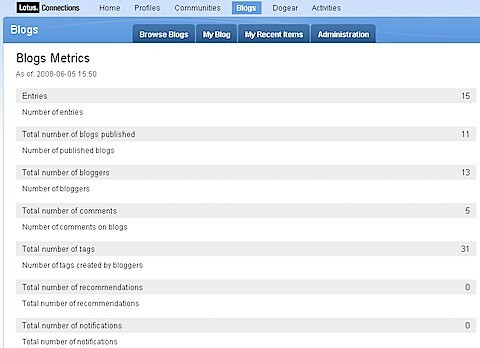 Have you seen those buttons out there in the web that say "digg this" or "Post to del.icio.us" ? Wish you could do the same for your Dogear implementation? Well, you can and it's super easy to do!! And no, you do NOT need to know anything about AJAX, XML, or Java. Another great function of Dogear is the ability to add a list of 'Related Bookmarks' to your pages. Think of your intranet portal. Think of all the pages that are out there. Let's take for example a news item about how your company is expanding its business in Asia. Wouldn't it be nice to have a dynamic list of links related to business development in Asia ? And with Dogear, this is super simple! And again, you do NOT need to know anything about AJAX, XML, or Java. In fact, no coding is necessary at all! All you have to do is, copy-n-paste. Simply open the Dogear page, do a search for "business development" and click on Add to Site in the bottom of the screen. Copy-n-paste the generated code into the page where you want to add it and voilá! You are done! That simple! A process that can not take more than 5 minutes. Cool, right?!?! I think so. It simply can't get any easier than that! As a techie/developer, that's yet another reason to love Lotus Connections. Most customers ask me if group membership in Communities can be used in other applications. 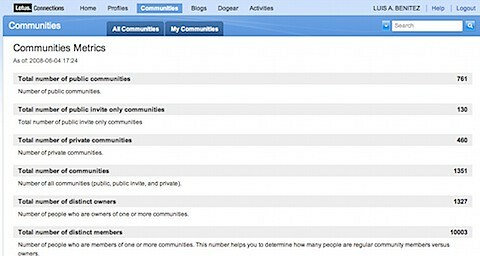 For example, can membership in a community control whether or not a user has access to a Quickr place ? In the next release, this will be done out-of-the-box. In the meantime, this can be easily accomplished by using the Communities API and retrieving the members for a particular community. Really. The possibilities are endless. I even worked closely with a customer who decided not to use the User Interface that ships out-of-the-box and completely create a brand new user interface leveraging the existing services! The great value of Lotus Connections is its flexibility to be customized mostly through configuration. There's very little that needs to be done with actual code. This helps increase the adoption rate because end-users feel comfortable using an environment that fits in their day-to-day lives. Additionally, IT has a LOT of power and control over the environment mostly through configuration!!! Moreover, the application has been designed from the beginning to be embedded into existing applications. And because Lotus Connections abides by the SOA concepts, this is easily done as shown here. The Lotus Connections APIs are so powerful that I'm sure I'm missing something. So I'm coming late in the game on this one, but have been busy tackling some "fires". A recent survey by IT services provider Telindus apparently finds that ~40% of 18-24 year olds would seriously consider leaving their job if their company blocks access to Facebook. That's a significant number, and it's always something I mention to my prospective customers, because it's true. If that generation doesn't have access to social software tools inside of the firewall, you can bet that they are going to go outside of the firewall to use it! And sure, companies may try to block sites like Facebook and MySpace, but there are so many ways to get around those blocks, such as using web proxies (a web proxy is a site you go to that lets you surf other sites without being blocked by your firewall). 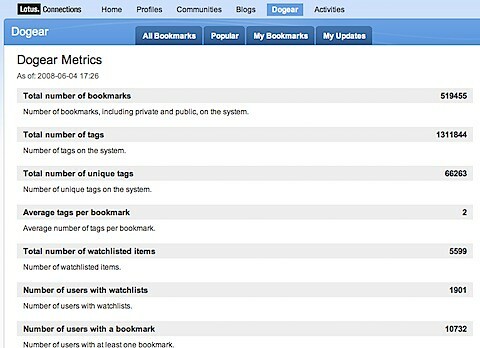 I, for one, wouldn't consider leaving IBM if they take away social bookmarking (Dogear), for example. But I can certainly guarantee that I would become much less effective in my day-to-day work, effectively costing my employer more money in the long run. I'm currently in the process of writing an article for developerWorks to describe the process of creating portlets that use the Lotus Connections APIs. Anyway, as I was saying, about a month ago a co-worker approached me and pitched the idea of creating an article that described how to use the Lotus Connections APIs from WebSphere Portlet Factory. I looked around and found no step-by-step example on how to do this. I only found a site with some examples, but it didn't explain how those examples were built. Therefore, I figured it would be of great value to the community to create this and, at the same time, it would be a good learning experience to get to know Portlet Factory. I did run into two snags, but I was able to resolve them within hours thanks to the WebSphere Portlet Factory Support Forum. Stay tuned to the Lotus Connections developerWorks page where the article should be posted in the coming weeks! The port numbers weren't set to 80 as before. I had to go into the <WAS_PROFILE_ROOT>\config\cells\<cellName>\LotusConnections-Config\LotusConnections-Config.xml and set the ports there. I had to re-run the TDI assembly line to update the user's GUID with the correct value from my Domino LDAP. Before I became the social software pre-sales techie, I used to be in Lotus Services. As an I/T consultant, my job was to deploy IBM/Lotus solutions to customers, integrate those solutions with existing enterprise applications, and perform any necessary customizations. As such, I spent numerous days and nights reverse engineering some of our products to determine the best way to integrate with them. In 2007, I took on Lotus Connections while I was still a software consultant. Of course, every customer wanted to integrate Lotus Connections with their enterprise apps and customize it to their needs. And I think, as a developer, that's when I truly fell in love with Lotus Connections. As a techie, I could NOT believe how simple and easy it was to customize Lotus Connections. You can pretty much do whatever you want simply through configuration with very little or no coding. In terms of integration, there's nothing easier than with Dogear. For example, say you have an intranet page dedicated to business development. Wouldn't it be nice to have a dynamic list of relevant links? Of course, it would!! And you ask: "But that's complicated right? Somebody probably has to sit down, read the Connections API documentation, get familiar with REST and Java, and code something in JSP, right ?" NO! All you have to do is, copy-n-paste. Simply open the Dogear page, do a search for "business development" and click on Add to Site in the bottom of the screen. It simply can't get any easier than that! As a techie/developer, that's one reason to love Lotus Connections. This is a continuation of Part II. I met an ITA (link to Marcelo person card) who has been blogging internally for about 2 years. 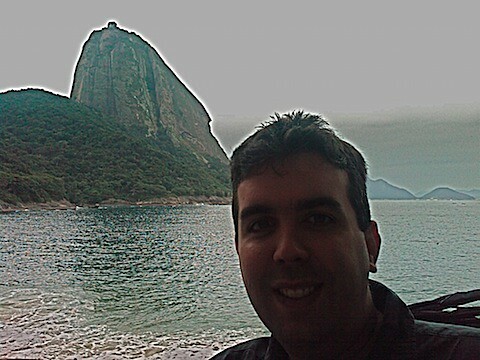 He strictly blogs in Portuguese because he feels he needs to target his local peers and evangelize social software. He communicated that he was a bit frustrated because people were commenting on his blog by email, instead of posting a comment directly on his blog. I encouraged him to set an example and comment on others' blogs and show people how it's done. Result: Success! Customer wants to start a pilot! Choose the right pilot audience. IBM has the international experience of how to do it right. We've learned from our failures and the failures of others. I suggested starting with a 6-8 week pilot, which customers usually frown upon because it's "too long". They, however, insisted that that was too short! And they want to plan a pilot that lasts at least 3 months. I see success in their future. Next steps: Customer wants to know which customers in their industry are using Lotus Connections and more about the Microsoft disaster at the Enterprise 2.0 conference. I'm going to create an Activity, of course, in the Greenhouse to continue my collaboration going forward. Oh, and I told the customer that I would be glad to come back, especially during Carnaval . I recently read a blog entry about the Architectural Principles of Social software and thought it was great. Tim Bull outlines what he thinks should be in the mind of IT and Business professionals when they are going to deploy a social software solutions, such as Lotus Connections. If you are following me on Twitter, you know that I just visited several customers in Rio de Janeiro to evangelize social software and discuss adoption strategies. I strongly focused on points 3, 5 and 6. Access to social software tools from the context I already work in is essential. If users live inside a Portal, that's where social software should be. If users are mobile, that's where social software should be. If users live in a mail client, that's where social software should be. Remember, you are "throwing" a new tool at your users. Don't make it a hassle to use it, otherwise adoption will not happen. So there you go. Your 10 steps architectural principles for social software to ensure that your implementation is a success and adopted by end users. What do you think ? Lotus Connections v2 (which will be released in less than 2 weeks) adds some very nice capabilities to visualize usage metrics. These metrics are useful during a Pilot and/or Production phase of deployment. During a pilot, it's important to see how much the servers are being used so that we can use that information when estimating a deployment architecture for production. It's also valuable to see how adoption is progressing. I, however, wouldn't rely strictly on usage reports to gauge the adoption within an enterprise. Instead, I think that's a task that the Atlas component for Lotus Connections can do much better!! During production, it also helps to see how the system is utilized to help gauge whether it needs more capacity. Don't, however, rely strictly on these reports. You should definitely use better server reporting tools. Have you ever wondered why IBM/Lotus created Lotus Connections? What's the actual business value to us as IBMers? And for our customers ? One of the key important points that I always talk with my customers is: integration. Integration is critical for user adoption!! Think about it! If you have a BlackBerry, do you use TwitterBerry or Facebook on it? Doesn't it make it easier to adopt those tools when it's pervasive in everything that you do? I think so! Thus, I also like this video because Suzanne, also discusses the free integration capabilities that ship with Lotus Connections. The video finishes with some things that IBM is looking at beyond 2.0. Enjoy! As we finished discussing the upgrade process, he told me "I'm in Westford this week". I said, "I know I saw it on Twitter". Then he said "I saw your voted in the primaries", and I'm like "Yeah, it was interesting" and he finished by saying "I know, I saw it on Twitter". A light bulb lighted on our heads. We both realized it at the same time. With Twitter, we can quickly let everyone what we are up to, so that when we collaborate, it's truly about business. It's as if Twitter removes a barrier to communication! Pretty cool!